Do you hear this often? You need to read more to better understand qualitative research. When I first started, I felt like I read thousands of articles and was still confused. I would pay attention to what the researchers did, how they wrote their purposes statements and research questions. I would try to copy how they wrote (oops) and pass it off as my own. I didn’t know what I was doing, it’s no excuse though. The problem with that is one, it’s plagiarism and two, it still does not get you any closer to understanding purpose statements and research questions. The truth is that it is difficult to fully understand the research process when you haven’t done it before. Right now, it’s all theoretical. You probably have read what you’re supposed to do in writing a proposal and it is just not translating on paper… or with your major professor. Yes, reading is important for your learning; however, if you don’t know what to look for while reading than you will keep going down this road of confusion. That’s why I created the Qual 101 virtual workshop. 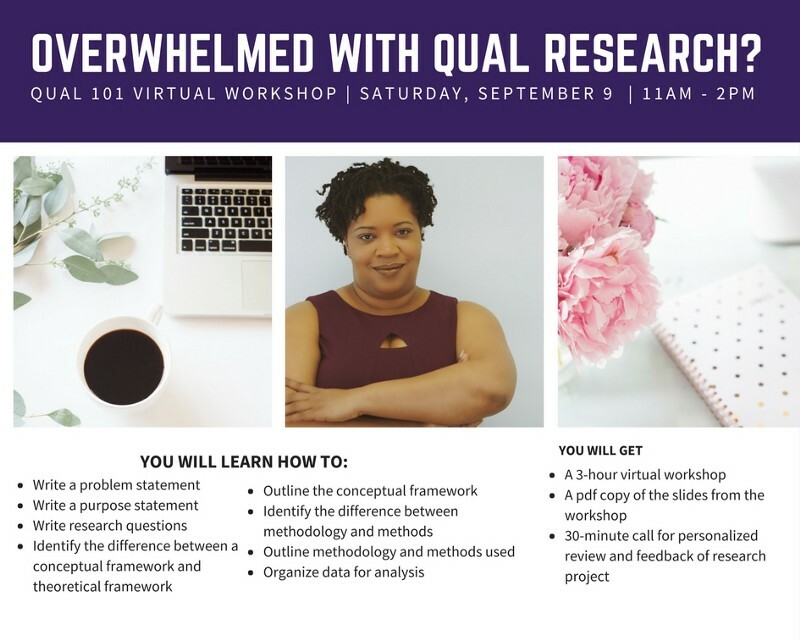 During the Qual 101 virtual workshop, we will be discussing exactly what you need to look for when you are reading. I will also help you to write your research proposal by explaining the necessary components needed. I will walk you step-by-step on what each component is, why it is important, and how you can write it. Research doesn’t have to be difficult and stressful. Once you learn more, you will begin to enjoy it as well. I would love to see you there on Saturday, September 9th.